In one new and one recent release, Austrian violinst Irene Kepl appears in two different contexts: As unaccompanied soloist and as a composer and participant in small ensemble play. SololoS, the new release, consists of twelve improvised solo performances. The performances are for the most part built around a limited set of motifs or techniques which Kepl develops through series of variation, some of them quite minute. She’s especially effective at creating rhythmic motifs out of insistent bowing patterns, which she subsequently colors with changing accents. Many of the pieces are densely textured with all four strings sounding simultaneously, to which Kepl occasionally adds her voice as a fifth layer. Resonators, released late last year, is a trio recording with Kepl on violin and electronics, George Cremaschi on double bass and electronics, and Petr Vrba on clarinet, trumpet, and electronics. As the title implies, the recording was made with the acoustics of the performance environment foremost in mind; the four pieces on the CD were recorded in two particularly resonant spaces in the Czech Republic. In order to fully exploit the natural resonance of the spaces, the acoustic instruments were fortified with amplification and feedback. Feedback dominates the first track, Cremaschi’s Affective Labor, which conveys a sense of sounds drifting in an expansive space. Kepl’s two compositions stand in pronounced contrast to each other, Soma focusing on timbral variability through bow articulation and slow counterpoint, and Pirol collecting brief, frenetic fragments of pitches and sounds. Pirol’s scattering of quick sounds is quite a different thing from the piece that precedes it, Vrba’s gravely beautiful Locus Resonatus. Here strata of long, overlaid tones create ambiguous harmonies that slowly accumulate tension as the dynamics build to a very gradual crescendo. The richness of the acoustic instruments comes through most clearly, helped along by Vrba’s switch from clarinet to trumpet as the piece unfolds. As an accomplished improviser accustomed to shaping performances in real time, Italian violinist Silvia Tarozzi often works with composers to develop pieces reflecting her interest in exploring sounds and the physical aspects of her instrument. All three performances on this new release are the result to varying extents of Tarozzi’s collaboration with their composers, and all bear the marks of the violinist’s own approach to the creation and elaboration of sounds. 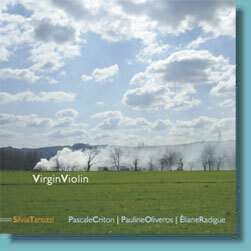 The first track is Circle Process (2010), a 27-minute investigation into microtonal relationships and pure sound by French composer Pascale Criton, who worked with Tarozzi to craft a piece that would draw on the violinist’s experience as an improviser. Accordingly, the work calls for a series of extended techniques centered around gestures performed over various parts of the violin, whose strings are tuned 1/16th of a tone apart. This scordatura comes to the foreground in several passages in which two or more strings are sounded at once, setting up beats and mutual sonic interference patterns that give the sound a palpitating, fluttering quality. The title of the work seems to refer to the circular bowing—sometimes rapid, sometimes slow and often on muted strings—that recurs throughout. On Thirteen Changes: for Malcom Goldstein, a 1986 composition in thirteen parts by Pauline Oliveros, Tarozzi supplements the austere solo violin with voice, objects, stones, radio, and recordings as well as Massimo Simonini’s electronics. The score consists of thirteen verbal phrases describing scenes, impressions or situations that are meant to serve as starting points for the performers’ improvisations. Tarozzi responds with economical and atmospheric collages in which identifiable sound sources combine with pure timbre. On the thirteenth piece Oliveros’ voice, reading the thirteen phrases, emerges from the sound of the violin being tapped, scraped and prodded over a field recording of rain. The final track is a performance of French composer Eliane Radigue’s Occam II (2012), one of a series of solo instrumental pieces inspired by 14th century English philosopher William of Ockham’s dictum that that explanation is best that requires the fewest possible causes or assumptions. As Occam’s Razor reduces explanation to its simplest elements, Radigue’s Occam reduces music to its simplest constituent: A single tone. Using long bowstrokes—and what may be two bows at once–Tarozzi draws out the latent harmonic complexity of the fundamental tone by revealing its upper structure of overtones. The piece ends with the solidity of the drone dissolving into ghostly harmonics.